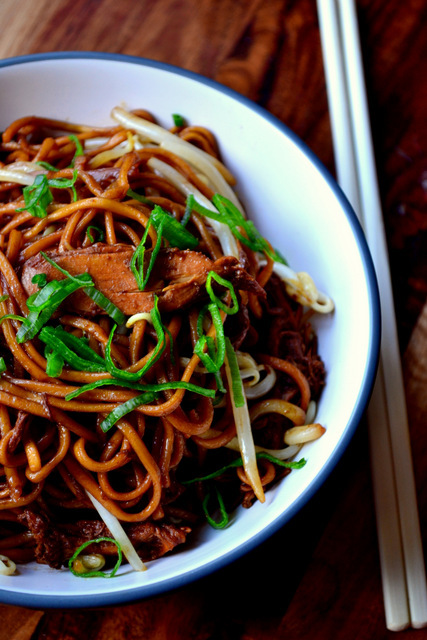 Almost certainly the most popular Chinese dish consumed in the country’s diaspora, chow mein (chāu-mèing) is, very simply, stir fried noodles. Of all the many varieties of chow mein, chicken chow mein is the most ubiquitous – at least in Britain. In my family if we have Chinese takeaway chicken chow mein is always lurking. For me, trips made to my local takeaway – though few and far between – are almost always accompanied by a hefty dose of inspiration. My recipe for Chinese Crispy Beef is testament to that. And this chicken chow mein is no different; I ate and was compelled to replicate. My compulsion to replicate was particularly strong here; many recipes for chāu-mèing seem far too complicated, with vegetables and other non-essentials thrown in without thought. Chinese cuisine is, at heart, a simple one. Few ingredients, rustic flavours; divine. As you can see, this recipe uses leftover roast chicken; chicken breast simply doesn’t do the job. Pieces of succulent brown meat combined with strips of roasted breast provides by far the best flavour. If you must cook with fresh chicken increase the marinating time and try using chicken thigh. The brown meat of a chicken is superior in flavour and texture to breast and it’s important that the taste of the meat breaks free of the soy sauce. The result of the recipe below is a sort-of gourmet version of the takeaway classic. Not left swimming in a watery soy sauce concoction, the noodles remain perfectly cooked with a slightly firm texture. And as a result of keeping things simple every flavour is individually recognisable and enjoyable. 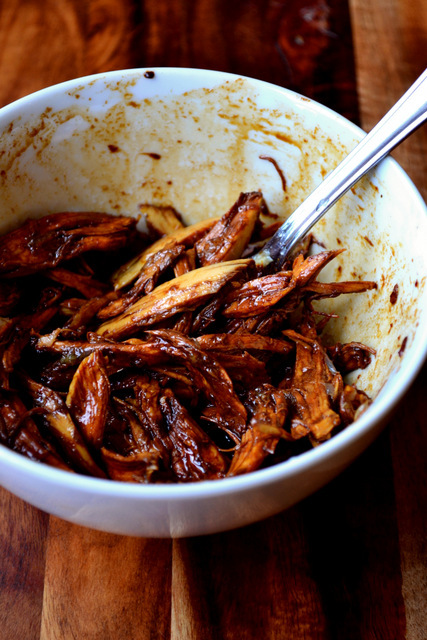 Create a marinade by mixing together 2 tbsp of soy sauce with half of the lime juice. Add the chicken and coat thoroughly. Cook the egg noodles according to the packet instructions (unless using fresh). Rinse through with cold water once prepared and set aside. Heat 2 tbsp of vegetable oil in a wok until smoking hot. throw in the ginger, garlic, bean sprouts and spring onions. Stir fry for 2 minutes and set aside. Heat 1 tbsp of vegetable oil in the wok, again until smoking, before adding the chicken. Cook for 2 minutes before tossing in the prepared noodles. Add the remaining soy sauce, lime, salt and brown sugar, followed by the prepared vegetables. Stir fry until piping hot throughout and thoroughly mixed. Serve immediately with a further drizzle of sesame oil and a little finely sliced spring onion. Cost: Roasting your own chicken and using the meat is the cheapest way of preparing what is otherwise quite an expensive product. Use it carefully – and boil the bones for stock – and what you have is enough meat for the week for around £5 (free range). 100g of chicken may not sound much, but over the course of 4 meals it stretched surprisingly far and we never felt as though the chow mein was lacking anything at all. Not bad for £2.40 all in. Very nice Nick. I haven’t cooked a chao mein in years. I must rectify that, now that you have inspired. me. Well done! I want noodles! I’ve been indulging in plenty of ramen recently and can’t get enough. 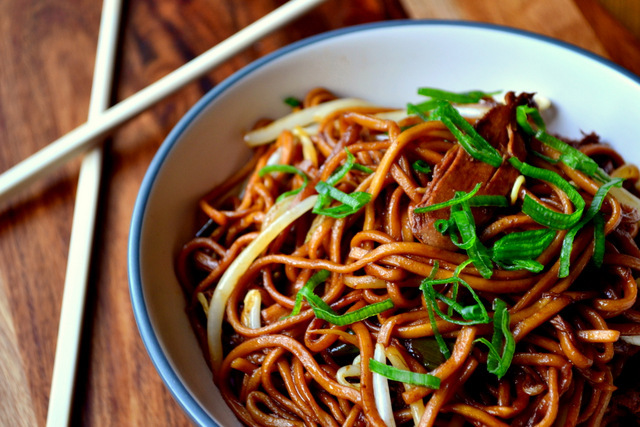 ‘Geography v popular recipes’ forms an interesting topic for discussion: ‘chow mein’ as a named dish seems to be predominantly popular in the United States and Great Britain. Tho’ I daresay served in other parts of the Chinese world diaspora, the term is hardly used in Australia these days altho’ most of us eat a variety of S Asian/SE Asian food, fusion or otherwise, most of the week. Interesting to research 🙂 ! I totally agree, lots of these “western” adaptations of Asian food are very interesting indeed. Thank you! The crispy beef was yummy. I don’t get takeaway very often. Just when in a rush! 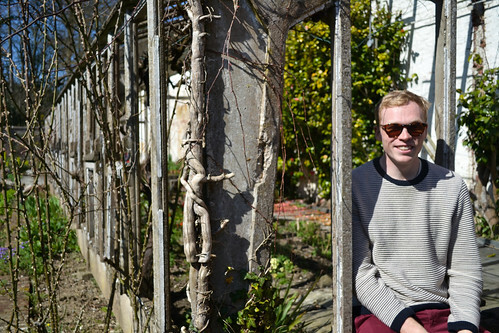 love the photos! this dish looks great 🙂 looking forward to seeing your other recipes. Thank you very much – take a look through my recipes. I’m sure you’ll find something you like. Said it before and I’ll say it again – fakeout take out is the absolute best. Well done, sir. Haha! Never heard it called that. But I agree – it is. 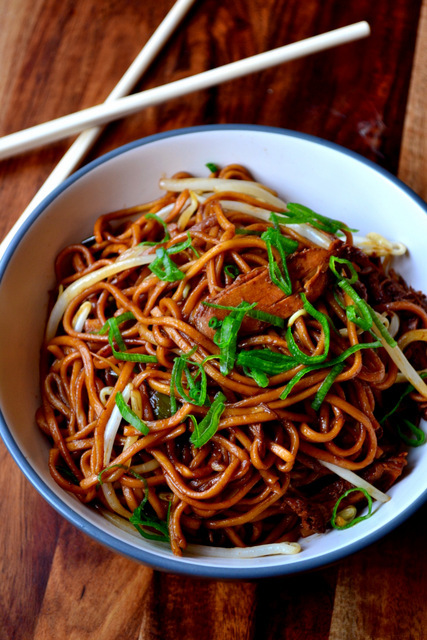 Thank you – give it a try, it’s a really simple chow mein and delicious too. Thank you – it was really rather delicious. Thank you – it was really yummy. This recipe looked so great I just had to try it! When I did it tasted awesome but my sauce just wasn’t as dark as yours even though I used a dark soy sauce. I was wondering if you could tell me what brand of dark soy sauce you used? Honestly? We’ve used a few. If it tastes delicious, I wouldn’t worry too much! Unfortunately not – you could copy and paste. I don’t like to encourage the use of surplus paper for the printing of recipes. this sounds awesome .Going to have to make it real soon .Thks for the recipe. Where do you add the sesame oil? I can only see a mention of a drizzle at the end and no where else? Oh no! I hope it turned out ok. Practice makes perfect, of course! Does it have to be leftover chicken or can it be raw? As Cat asked, when is the sesame oil added? Right at the end – it’s used for seasoning.